Many were filled with anger following the decision of the WBO World Welterweight championship fight between then champion Manny Pacquiao and undefeated Jr. Welterweight champion Timothy Bradley in June of last year. Many fans and experts, this one included believed that Manny Pacquiao won the fight decisively and that an injustice took place. Anger however was not exclusively pointed at the three judges who scored the fight but also the promoters and most unjustifiably Timothy Bradley. What seemed to be overshadowed in the aftermath of the fight was the bravery that Timothy Bradley showed in a fight where he suffered ligament damage to both feet. Bradley’s courage certainly cannot be questioned. Bradley feeling he had something to prove returned to the ring to defend his Welterweight world title for the first time on March 16th against Jr. Welterweight contender Ruslan Provodnikov who was moving up in weight to the Welterweight division. The bout which took place at the Home Depot Center in Carson, California was not expected to produce fireworks however, when it comes to the sport of Boxing it is always best to “Expect the Unexpected”. Bradley who is an effective combination puncher is known as a fighter who wears his opponents down gradually as the fight goes on from an accumulation of punishment. In this fight however Bradley chose to stand toe to toe with Provodnikov. In the latter stages of round one Provodnikov staggered the champion with an overhand right and Bradley went down to the canvas seemingly caused from the effect of that punch. Despite what appeared to be a clear knockdown scored by Provodnikov, it was ruled a slip by Referee Pat Russell. The two fighters continued to engage in a back and forth battle with Bradley landing more punches but Provodnikov seeming to land the more damaging blows. Bradley however was most effective in periods where he was able to control the distance and somewhat nullify Provodnikov’s offense. Bradley was able to clearly win rounds three, four, and five in the opinion of this observer based on his ability to punch in combination to the head and body. Bradley also threw more and landed at a higher percentage. Provodnikov was able to stagger Bradley again in round six and appeared to have the champion out on his feet. Bradley however showed his mettle gamely fighting off the ropes in what should be considered the highlight exchange of the fight. An argument can be made based on Provodnikov’s burst of offense in that round that the fight could have been even thru six rounds on most scorecards. The scorecards of official judges Jerry Cantu, Marty Denkin, and Raul Caiz Sr. were in fact even at 57-57 after six rounds. In some ways this fight could be described as two fights in one, Provodnikov getting the better of the exchanges when Bradley was willing to oblige, engage toe to toe, and Bradley controlling the fight when he chose to box using his jab and lateral movement to control distance. The champion was able to win rounds seven, eight, and nine by out boxing Provodnikov. Although some may not fully appreciate a boxer’s craft it is pleasing for Boxing purists to see one show the ability to adjust during the course of the fight. Bradley at this stage was able to take control of the fight. It was also at this stage of the bout when it appeared that Ruslan Provodnikov could have been in danger of being stopped due to a severe cut that opened over his left eye in round eight. Much like Timothy Bradley showed his mettle in this fight, so too did Provodnikov by continuing to come forward and absorbing significant punishment in the process. Despite being badly cut Provodnikov remained dangerous and always “Game”. As the fight entered the late rounds Bradley continued to box effectively however was briefly stunned by a left hook by Provodnikov in the closing seconds of round ten. In round eleven Provodnikov came out and was more aggressive than he had been in previous rounds in trying to get his punches off first. Bradley neglected the Boxing strategy that got him in control of the fight from rounds seven thru ten and again chose to exchange with Provodnikov. Provodnikov was able to win the close round based on landing the harder punches. It would set the stage for what would be a memorable round twelve. The twelfth round began with Timothy Bradley utilizing good lateral movement and landing combinations to the head and body. For the first minute and a half of the round it seemed as if Bradley would win the round decisively over a “Game” but badly fatigued Provodnikov. In the final minute of the round however Provodnikov badly staggered Bradley with left hook that had the champion reeling. Provodnikov at this point threw all that he had left in him and was able to force the champion to take a knee in the closing seconds of the fight. Bradley was able to get to his feet and the final bell rang bringing to an end what turned out to be a thrilling fight. There was little doubt at the conclusion of this fight that the fight was close. A few questions presented itself. Despite Bradley going down in the first round being ruled a slip by Referee Pat Russell an argument could be made by some that the damage that Provodnikov was able to inflict in that round may have been worthy of it being scored 10-8. Based on this and Provodnikov being able to win round eleven and scoring a knockdown in round twelve, it wasn’t hard to see the possibility of either a narrow win for Provodnikov, a narrow win for Bradley based on how he was able to take control of the fight in the middle rounds or, certainly a justifiable draw. Although Timothy Bradley won this fight on all three scorecards he essentially won this fight by one point on the scorecards of Judges Marty Denkin and Jerry Cantu. In terms of points it all came down to the call of a slip in round one that many feel, this observer included should have been ruled a knockdown in favor of Ruslan Provodnikov. If Provodnikov was credited with a knockdown in that round this fight would have ended in a draw. All three judges scored the first round for Provodnikov 10-9. Bradley on the other hand dispelled all disbelievers on this night. He not only proved he is courageous, willing to engage toe to toe, but also displayed a champion’s heart. To fight on and continue to come back from the brutalizing barrage of Provodnikov’s offense was truly astounding. What’s next for both Bradley and Provodnikov? To date in 2013 these two great fighters have my vote for Fight of the Year. This fight left me wanting more. My first choice would be a rematch for I cannot see another opponent for either of them creating as much excitement. No this fight was not historic per se, nor was it the greatest fight ever, and it probably will be outdone in the future. Simply put, this was a great fight and it deserves a sequel. Bernard Hopkins Once Again World Light-Heavyweight Champion “HIS-STO-REE “! Regardless of how you spell it, pronounce it, or what you think of history when it comes to Boxing you must think of Bernard Hopkins. Hopkins not only defines it, he continues to rewrite Boxing history. Hopkins continues to prove to young fighters the need to study the Science of Boxing. Hopkins is the master of the class and continues to teach the Sweet Science of Boxing. On March 9th we were treated to Hopkins’ style of education first hand. A lesson for all young fighters to heed. 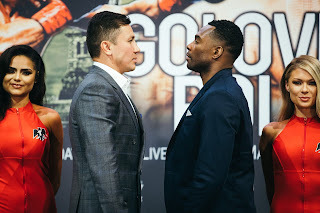 When I previewed the IBF World Light-Heavyweight championship fight between undefeated champion Tavoris Cloud and the seemingly ageless two-division world champion and future Hall of Famer Bernard Hopkins, I stated the keys to success for each fighter. For Cloud it was critical in my view that he get Hopkins’ respect and establish himself from the outset. Cloud needed to establish a consistent punch output and put smart pressure on the forty-eight year old Hopkins. If Cloud were able to accomplish this, it could have resulted in a difficult night for the challenger. For Hopkins the keys to success were that he needed to establish the pace of the fight. Hopkins needed to make the thirty-one year old Cloud, a man seventeen years his junior fight his kind of fight from the opening bell. Hopkins’ ability to utilize effective defense, angles and lateral movement were crucial components to his success in this fight. He could not allow himself to become a stationary target for the champion who entered this fight with a career knockout percentage of nearly 80%. Hopkins needed to get off to an early start in this fight and not allow the champion to win the early rounds. In some of Hopkins’ notable losses an argument can be made that one of the things that went against him was that he didn’t really step up his pace until the middle rounds. In closing the preview of this bout I stated that conventional wisdom suggested we were likely to see a competitive fight that would be rough and could be ugly at times. When the two fighters entered the ring on March 9th at the Barclays Center in Brooklyn, New York, the Boxing world was treated to what in many ways amounted to a typical Bernard Hopkins kind of fight. Hopkins controlling the tempo of the fight, not throwing punches at a necessarily high volume but landing the cleaner blows and making his punches count. Cloud meanwhile was able to find sporadic success landing his right hand however was not able to establish a consistent offensive flow as in many of his previous bouts. This can be attributed to Hopkins’ ability to use angles and being able to keep Cloud from planting his feet to throw his punches. Cloud’s inability to neutralize Hopkins and let his hands go worked against him particularly during periods when Hopkins wasn’t throwing much. Cloud also did not seem to throw his jab often enough and that could have set up more opportunities for his offense. An argument can be made that although the final scores at the end of this twelve round championship bout appeared lopsided in favor of the victor Bernard Hopkins, that the bout round by round was close. In the eyes of this observer Hopkins was able to win this fight by making the absolute most out of what he was able to accomplish offensively while neutralizing and nullifying the younger man’s offense and rhythm. It can be viewed, that if Cloud were able to land more in several of the rounds that this fight could have appeared much closer, at least in terms of the official scorecards. In fights where there are periodic lulls in the action it boils down to which fighter was able to establish ring generalship and land the cleaner punches. In this case that fighter was Bernard Hopkins. Former Heavyweight champion Larry Holmes ended his fighting career at age fifty-two and was considered to be “The Professor” of the Sweet Science of Boxing. The main focus of the lessons he taught emphasized the jab. Bernard Hopkins with no retirement in sight at age forty-eight can be considered the “Master of the class”. Hopkins’ emphasis and the lesson to be learned by all young fighters is the fight plan and the ability to adjust the plan if needed. Many young fighters develop a solid fight plan but fail to adjust when it doesn’t work. Tavoris Cloud is a solid fighter. Unfortunately Cloud failed to include the jab as a principal weapon in dealing with Hopkins. If Cloud were able to adjust his fight plan by throwing the jab to get on the inside and go to the body of Hopkins consistently, the result of this fight may have been very different. To put it in simple terms, if you’re a fan of the Sweet Science of Boxing, Bernard Hopkins is a fighter that emphasizes the craft that is Boxing. This fight was precisely a demonstration of the depth of Hopkins’ skill and an example of why he calls himself “The Executioner.” Bernard Hopkins “Executed” a near perfect fight plan. Can Bernard Hopkins make history one more time? Former Middleweight and Light-Heavyweight world champion Bernard Hopkins has had a career that most young fighters would probably dream of. In a career that has spanned nearly twenty-five years, Hopkins has certainly earned the moniker of future Hall of Famer. Hopkins will of course go down in history as a legitimate top five all-time Middleweight. Twenty successful title defenses, the most in the division’s illustrious history in a ten year title reign from 1995 to 2005. During this period Hopkins went on to totally unify the World Middleweight championship becoming the only fighter in history to hold all four major world titles in a division at once. As if Hopkins’ accomplishments as a Middleweight were not enough to solidify his legendary stature in the sport of Boxing, upon leaving the Middleweight division Hopkins showed that he is one of the sport’s top Light-Heavyweights. Since scoring a dominating victory over former Light-Heavyweight champion Antonio Tarver in 2006 Hopkins has continued to be a force in the division facing the likes of Joe Calzaghe, Jean Pascal, and Chad Dawson just to name a few. Despite suffering close losses in his fight with Joe Calzaghe and in his rematch with Chad Dawson, Hopkins continues to arguably garner the most attention of any fighter in the Light-Heavyweight division. Now at age forty-eight Hopkins sets his sights on attempting another historical feat. To break his own record as the oldest fighter in history to win a major world title in the sport. A record he set at age forty-six surpassing the legendary George Foreman. The man standing in Hopkins’ way of continuing to make history? The undefeated International Boxing Federation (IBF) Light-Heavyweight World champion Tavoris Cloud. Cloud, unbeaten in twenty-four professional fights has made four successful defenses since winning the then vacant IBF Light-Heavyweight title by defeating former IBF Light Heavyweight world champion Clinton Woods in 2009. During his title reign Cloud has been tested by high caliber opposition most notably the before mentioned Clinton Woods and then by former IBF Light-Heavyweight world champion Glen Johnson. Despite those notable wins one might argue that Cloud has never been in with a fighter of the caliber of Bernard Hopkins. Cloud does however have a career knockout percentage of nearly 80% and should be viewed as dangerous. Cloud’s exciting come forward pressure style has made him a fighter to watch. Cloud has however had difficulty in his fights with Woods, Johnson, and most recently Gabriel Campillo. In his fights with Woods and Johnson Cloud was able to establish a high punch output. Although Cloud took his share of punishment, particularly in his fight with Glen Johnson, he was able to win those fights by outworking both fighters. Despite a good start in his fight with Gabriel Campillo in February of last year, knocking Campillo down twice in the first round one might argue that Campillo may have provided somewhat of a blueprint for future Cloud opponents. After weathering the storm in the first round of that fight Campillo was able to regroup and execute an effective fight plan that emphasized lateral movement, angles, and hand speed. In contrast both Woods and Johnson were willing to stand right in front of Cloud and more or less fight him in a phone booth. Campillo however in the opinion of this observer was able to gradually take control of the fight getting the better of the exchanges, landing in three or four punch combinations. Although Cloud would have periods of effectiveness it was Campillo who seemed to dictate the action. Despite Cloud retaining his title via a controversial split decision, I feel that coming out of that fight that there are perhaps more questions for Cloud to answer as he enters this fight against Hopkins. So what are the keys to success for both fighters in this fight? For Cloud I believe it is critical that he get Hopkins’ respect from the outset. Cloud needs to establish himself early and put smart pressure on Hopkins by cutting the ring off and nullifying Hopkins’ movement. Cloud must however pace himself. Although Cloud is known for having consistently high punch outputs it is vital that he not punch himself out and conserve his stamina. Hopkins has never been stopped in his career of sixty-two professional fights, barring something unexpected I believe most expect this fight to extend into the middle or late rounds. Hopkins has shown that he can turn up his pace as the fight progresses. It will be interesting to see how Cloud will adjust as Hopkins executes his fight plan. It will be equally interesting to see how Cloud responds to any clinching and or grappling on the inside from Hopkins a fighter who is a master of the craft of Boxing but also a fighter who is a grizzled veteran who knows how to frustrate his opponents. In contrast for Bernard Hopkins to be successful in this fight he needs to establish the pace from the outset. One thing that Gabriel Campillo utilized which made him very effective when he fought Cloud was angles. Hopkins is a fighter with great defense and has shown the ability to be elusive. Hopkins needs to give angles and avoid being a stationary target for Cloud who will be looking to put pressure on him and push him back. As it is critical in this observer’s eyes that Cloud establish himself early in this fight, it is critical that Hopkins not get off to a slow start. Some might argue that one element that has gone against Hopkins in fights that he’s lost to Jermain Taylor, Joe Calzaghe, and Chad Dawson is that he seemed to start slow and pick up his pace as the fight went on. It is important that Hopkins be consistent with his punch output and not allow Cloud to outwork him. If Hopkins chooses to fight only in spurts, even though he may have periods of effectiveness, judges are likely to favor effective aggression. Hopkins must be consistent in this fight. Cloud vs. Hopkins may end up being one of the one of the best fights of the year. A young undefeated world champion still looking to prove that he belongs with the elite of his division facing a future Hall of Famer who is seventeen years his senior. A victory for Cloud will no doubt establish him as a star player in the Light-Heavyweight division and could set up future big money fights with the fellow champions of the division Beibut Shumenov, Nathan Cleverly, and Chad Dawson. After all the title “Undisputed” is the ultimate goal. A victory for Bernard Hopkins will add another accolade to what has already been a historical career that few fighters could compare to. Although Hopkins has made a career of proving skeptics and naysayers wrong, the question that most probably have as this fight approaches is will Hopkins be able to beat father time once again? Whether or not that question will be answered in this fight with Cloud remains to be seen. No matter the outcome the Boxing World can at minimum can be assured of an entertaining night of Boxing with historical implications. The attention of the Boxing World will now center on the Barclays Center in Brooklyn, New York when Bernard Hopkins challenges Tavoris Cloud on Saturday March 9th. Conventional wisdom suggests that we are likely to see a competitive fight that will be rough and could indeed be ugly at times.